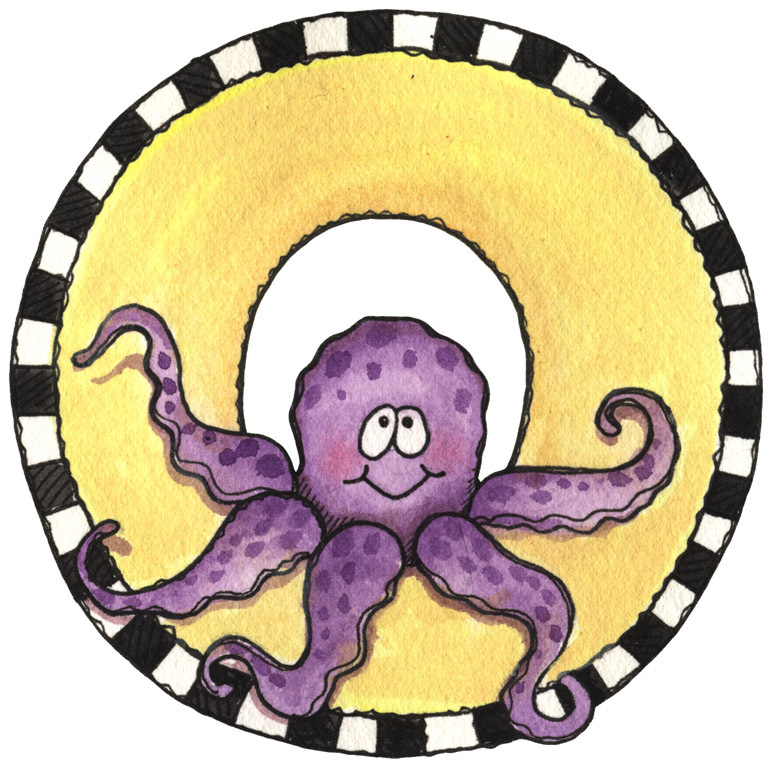 Gli “V” Word continues to celebrate VeganMoFo, un mese di cibo incredibile Vegan, con l'altra 25 lettere dell'alfabeto. 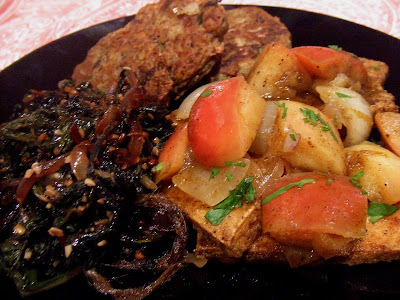 Oggi “Il” è per Cipolla e Apple Relish Tofu. Ok, onestamente, il nome di questo piatto è Tofu con cipolla e Apple Relish, ma ho girato intorno per farli partire con una “O.” Consider it my literary license. This is a dish that is so easy yet so impressive. 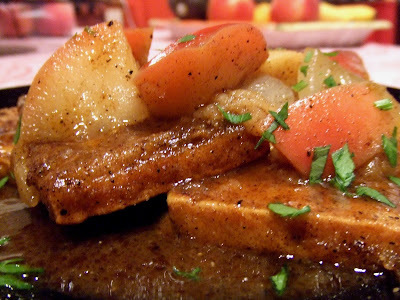 Crispy pan-fried tofu slices smothered in a warm, syrupy apple cider vinegar sauce filled with softened chunks of onions and apples. Ci vuole solo 5 ingredients to create a relish that looks and tastes so complex, people will think you are a culinary genius. Naturalmente, you can make the same relish and use it to top tempeh or seitan cutlets. It would also taste delicious all on its own as a side dish. The sweet apples and onions mixed with the tangy apple cider vinegar are a marriage made in heaven. If you’ve been wondering what to make for Thanksgiving dinner, this will make your guests ooh and aah. 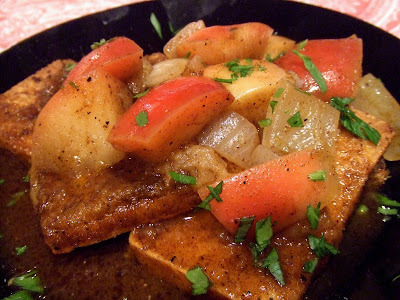 My Onion and Apple Relish Tofu looks, smells and tastes like autumn. I served it with potato latkes and sauteed Swiss Chard. It’s a beautiful addition to your menu that will turn any meal into a celebration! Tagliate il tofu in 8 fette. Faccio questo tagliando il blocco a metà nel senso della larghezza, poi tagliando ciascun semi-blocco in 4 fette rettangolari sottili. Mettere la farina di ceci in un piatto. Season it with salt, pepe, sage and cumin. Coat entrambi i lati delle fette di tofu con la farina. Shake off any excess flour. Calore 2 Tbs. oil in a large skillet over medium-high heat. 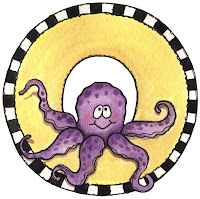 Fate rosolare le fette di tofu fino a quando sono dorate e un po 'croccante su entrambi i lati, circa 4 minuti per lato. 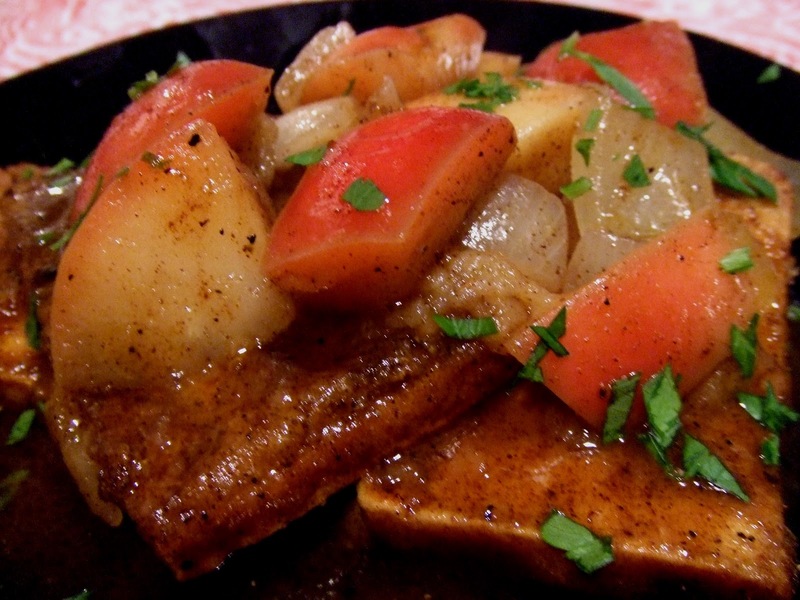 Transfer the tofu to a platter and put it in the oven to stay warm and crisp. Add the onion and apple to the skillet. If you need more oil, add another tablespoon. 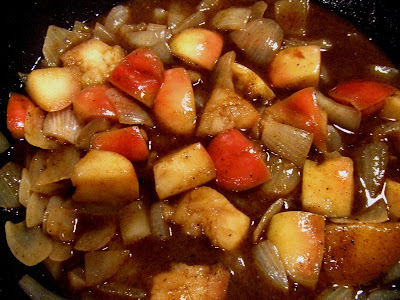 Increase the heat to high and cook until the onion is wilted and the apples are golden brown. Questo dovrebbe richiedere circa 3-4 minuti. Add the vinegar to pan. Bring it to a boil until the vinegar thickens and becomes syrupy. Add the broth and return it to a boil. Cook until the broth reduces to about half. Remove the pan from the heat, add salt and pepper. Whisk in the vegan butter until smooth. Top the tofu slices with the red onion and apple relish. Add parsley for garnish. Servire a caldo. Godere! “Il” è per Cipolla e Apple Relish Tofu. Per gli altri “Il” parole, controllare il mio Arancione Cavolfiore, Broccoli and Cherry Tomatoes with Brown Rice Pasta in a Roasted Garlic Walnut-Coconut Cream Sauce e il mio Arancione Finocchi Insalata con Agave Senape Dressing. VeganMoFo: "N" è per la Nutrizione – Recensione del libro "Guida The Complete Idiot di Nutrizione Vegetale"
Very nice and creative blend of flavors! Thoroughly enjoyed. Saw this on the MoFo feed — I love using apple in savory dishes and this looks great! Bookmarked to make as soon as MoFo is over! 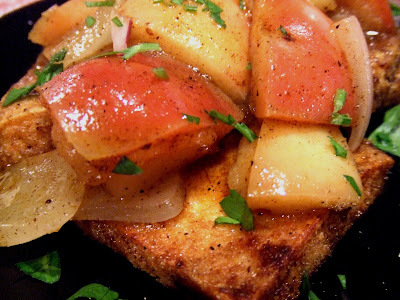 I love anything that combines apples and onions and this looks particularly amazing!